A Feast for the Eyes: Food in Art features paintings and photographs by Pacific Northwest artists Christopher Boffoli, Kristen Reitz-Green and Jere Smith. The exhibition is an invitation to enter other worlds through beautiful food. West Seattle’s Christopher Boffoli’s photographs of tiny train layout figures enacting dramas set in landscapes of food are enticing an international audience in galleries in London, New York, Toronto and Monaco. Boffoli writes “The sensual experience of eating accesses primal instincts that stretch back to the earliest days of our evolution. Whether we are reflecting on the comfort food of childhood, celebrating food’s tremendous diversity, or obsessing over calories and nutrition, cuisine is one of those rare topics that most people can speak about with authority and yet largely without controversy.” Boffoli’s work is included in this exhibition courtesy of Winston Wächter Fine Art, Seattle. After devoting her professional life to playing the French horn in various orchestras across the US (including the Pacific Northwest Ballet Orchestra) as well as Broadway show tours, Vashon Island resident Kristen Reitz-Green shifted her focus to painting. Her intricate portraits of bread, caramel apples and a dewy chocolate and almond-covered ice cream bar are truly feasts for the eyes. Grazing on these rich delights, the eye hungrily moves across a surface that is both painterly and photographic in visual representation. 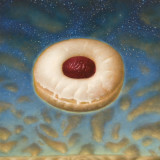 Seattle artist Jere Smith’s paintings of donuts glow with an almost mystical homage, with their singular subjects floating purposefully against ethereal skies. Lemon, chocolate-sprinkled, old fashioned, and jelly filled nuggets of perfection bask in soft brushwork as they suggest narratives of pleasure and mystery.